South Korea, a country in East Asia bordered by North Korea, Yellow Sea, and the Sea of Japan has a total land area of 38,691 square miles and a population of close to 48.9 Million. 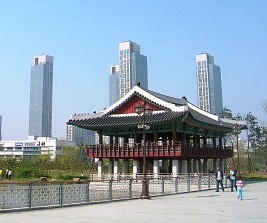 Korea is mostly mountainous and arable land (lowlands) is only a third of its total land area. Korea, a large nuclear power producer, is a high-income developed country with a technologically advanced transportation network. Manufacturing and exports along with services and technology are the components of the economy. In its quest to get to the present state, the country was on a growth expressway that greatly overlooked the environment. To offset this costly error, a green-based economic strategy is in place – nationwide bike network, harnessing solar and wind energy, introducing energy efficient vehicles, and embracing environment friendly technologies are some of them. The best time to visit South Korea is September through November for the fall foliage and the slight chill combination works wonders for a pleasant stay. Its temples, national parks, historic sites, palaces, beaches and cultural villaes have always pleased its visitors. It has over 20 National Parks and nine World Heritage Sites. Seoul, Gyeongju, Buyeo, Jeju, Mt. Seorak, Shinhungsa Temple, Gwongeumseong, Hahoe Folk Village, Yangdong Village, Boseong Tea Fields, and Korean Folk Village are some of the major attractions. Rice, noodles, tofu, vegetables, fish and meats are the basic components of its cuisine. A typical meal would consist of steamed rice with many side dishes. Kimchi is served at almost every meal. Frommer’s South Korea 978-0470591543 $17 Detailed maps, Reviews of hotels and restaurants, Itineraries, walking tours, and trip-planning ideas. Korea North and South Nelles Map 978-3865742445 $12 1:1.5M Scale. Inset map of Central Seoul. The first stamps of Korea were a set of two stamps released in 1884 showing Yin Yang symbol. The set (Scott #1 to #2) catalogs for around $60 Mint. Both the Korea’s were ruled by the Joseon Dynasty for centuries. In 1895, following Japanese victory in the First Sino-Japanese War, Korea became a sovereign nation, independent from the Qing Dynasty of China. The dynasty ceased to exist in 1910 following the Japan-Korea annexation treaty. Varieties on the Yin Yang designs were the primary stamp issues of Korea until the turn of the century. The sets from the period are rare and valuable cataloging into the 1000s for MNH and somewhat less for Used. Korea released a stamp on October 18, 1902 showing the Emperor’s crown. The stamp (Scott #34) catalogs for around $40 Mint and around half that for Used. It was issued to mark the 40th year of the reign of Emperor Gojong. He was the 26th king of the Korean Joseon Dynasty and the first emperor of the Korean Empire. Gojong was forced to abdicate in 1910 following the Japn-Korea Annexation treaty and died in 1919 while in confinement. At the end of World War II, the nation was divided into North and South Korea – the north was occupied by Soviet forces while the South was controlled by the US following liberation from Japan. A set of five stamps released in 1946 showing Map, Crown, and other symbols. The set (Scott #69 to #73) catalogs for around $15 MNH and $7 Used. There is a variety with a different perforation (11) for part of the set (Scott #70a to #72a) that catalog for around $75 MNH and $40 Used. The designs show Astronomical Observatory of Kyongju, Hibiscus with Rice, Map of Korea, Gold Crown of Silla Dynasty, and Admiral Li Sun-sin. A long set of forty two stamps released between 1951 and 1952 in the Korean war theme. The set (Scott #132 to #173) catalogs for around $550 MNH and around $200 Used. The designs show the flag of South Korea along with a flag of the participating country. The Korean War was fought from June 25, 1950 when North Korean forces invaded South Korea and continued until an armistice was signed on July 27, 1953. It was the first significant armed conflict of the Cold War with United Nations aiding South Korea under the leadership of the US and China along with Russia helping North Korea. Casualties of the war added up to more than 1.8 Million. A long set of nineteen stamps released between 1964 and 1966 showing local scenes & history. The set (Scott #360a to #374a) catalogs for around $250 MNH and $30 Used. The designs show Hanabusaya Asiatica, Miruk Bosal, Long-horned Beetle, Symbols of Thrift and Development, Meesun Blossoms and Fruit, Library of Early Buddhist Scriptures, Sika Deer, King Songdok Bell of 8th century, Bodhisattva in Cavern Temple of Silla Dynasty, Tile of Silla Dynasty, Jin-Do Dog, Folk Dancers, Miruk Bosal, Ginseng, King Sejong, Rice Farmer, Dragon Waterpot, Ancient Drums, and Blue Dragon Fresco of Koguryo Dynasty. A long set of twenty two stamps released between 1990 and 1996 showing local scenes. The set (Scott #1577 to #1594D) catalogs for around $20 MNH and $9 Used. The designs show Flag, Stork, White Magnolia, White Pine, Cart-shaped Earthenware, Fire Safety, Environmental Protection, Traffic Safety, Waiting One’s Turn, Saving Energy, Child Protection, Purification of Language Movement, Rose of Sharon, Give Life to Water symbolical, Ginger Jar, Pine Tree National Monument, Drum Dance, Mask, Hong Yong-Sik, King Sejong with Korean Alphabet, Dragon Head, and Gilt-bronze Buddha. A set of two stamps and a souvenir sheet released on December 1, 2000 to mark the New Year. The set (Scott #2040 to #2041 and #2040a) catalogs for around a dollar MNH or Used. South Korea has released a number of stamps to mark the New Year over the years. It is a good topical collection theme. The first coins of Korea called the t’ongbo were minted around 996AD. Chinese currency was in predominant use during the period. From the mid-seventeenth century till the late-nineteenth century, Korea issued cast coins with a square center hole. There are a huge number of varieties of this issue. In the modern era, South Korea started issuing coins in 1959 with the issue of Bronze Hwans showing Value in Obverse and Rose of Sharon in Reverse. The first issues have huge mintage (100M) but still catalogs for around $75 in BU. South Korea first gold coins were proofs issued in 1970 with low mintage. They also issued a series of proofs with Olympic theme between 1986 and 1988. They enjoy a good premium over bullion value. Coins $2 and up Common UNCs from the 1990s onward starts around $2. High value issues from the 1980s and prior dates in XF start around $10. Commemorative Silver Proofs start around $50. Olympic Silver Proof Sets and certain other low mintage proofs start around $100. Gold coins and certain high value frosted proofs go well into the 100s and 1000s. Paper Money $3 and up Common UNCs and issues from the 1950s onward in VF starts around $3. High Value UNCs from the 1950s onward starts around $15. Uncut Pairs, Early Large Notes, etc start around $50. UNC Bundles, Scarce Dates, and Low Numbers go into the 100s. Ginseng, amethyst, green tea, tea sets, tea glasses, and tea cups with strainers, chopsticks, and chocolate are souvenirs unique to South Korea. Antiques $10 and up 19th century and early 20th century maps and original photos start around $10. Choson Yi Dynasty pottery bowls start around $50. Vases, inlaid brush pots etc start in the 100s and go into the 1000s. Art $10 and up Music posters start around $10. 19th century local scenes and historical prints start around $20. Original works by John Pike, Paul Jacoulet, etc go well into the 100s.